Highway Police in Krabi today arrested a man from Pattalung who had in his possession 24,000 methamphetamine pills (ya bah), a 9mm pistol and 13 bullets. 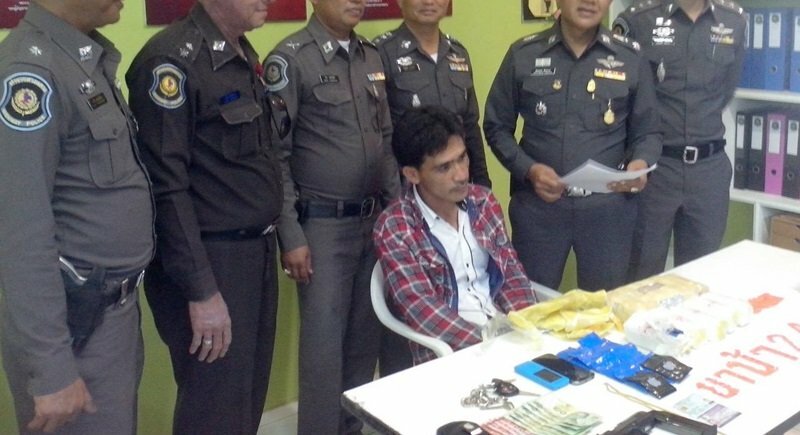 The arrest came after police received a tip-off that there would be drugs smuggled from Pattalung into Krabi today. Following the tip-off police set up a checkpoint in front of Krabi International Airport. Here they stopped a car which had a distinguishable lion sticker on the windscreen, the logo of the Department of Provincial Administration. Police stated that the driver was acting suspiciously and had the look of a drug addict. The 24,000 pills, pistol and bullets were found on the passenger seat of the car. The driver, BoonHai Wansoh, 31, told police that he was a rubber-tapper, but as the price of rubber has gone down he couldn’t survive so he turned to drug smuggling. BoonHai admitted that he picked up the drugs in Pattalung and would deliver them to Ao Nang, Krabi. He would be paid B30,000 for each delivery and he had done it twice before. He also stated that he put the lion logo sticker, given to him by his son’s friend who is an OrBorTor official in Songkhla, on the car as he thought it would stop police from checking the vehicle. Police are currently carrying out more investigations in the hope of finding more members of BoonHai̕s smuggling network. BoonHai is likely to be charged with possession of a Category 1 drug with intent to sell.